Porter has a long history, with its own creation story and tales of its subsequent evolution intertwined with the changing technology, emerging consumer protection laws, tax structure and pub culture of England . . . but that isn’t the point of this article. This article is about the practical considerations homebrewers face when brewing an “ordinary-strength” porter, with ingredients you can find in your homebrew shop. Porter is one of the most flavorful styles of beer. As such, we’ll look at porter from the perspective of its component flavors. Brown porter is a mildly-roasty, chocolate-flavored brew, usually with a nice dollop of caramel sweetness — pretty much a darker version of brown ale. Robust porter is, well, more robust. Darker grains, usually including black patent malt, lend a sharper edge to its roast character. Higher gravity and higher hopping rates make it a more aggressive beer than brown porter. If you’re like me and worry about flavor first and styles second, porter can be brewed on a continuum from smooth and mild to sharp and aggressive, and everything in between. Darkly roasted malts are the cornerstone of any porter. Both the aroma and flavor of a good porter will show a nice, roasted malt character. This can also be accentuated with the aroma and flavor of roasted (unmalted) barley. Most porters have a chocolate edge to their roastiness, especially those brewed in the brown porter tradition. Many also have coffee notes. Robust porters may additionally have a highly-roasted character to them that has a bit of a bite to it. Given the wide variety of darkly-roasted malts and grains available, porters show a wide variety of roast profiles. Most porters are formulated with at least some chocolate malt. You can, in fact, make a nice, mellow porter with a good-quality chocolate malt being the only dark grain in your grist. Chocolate malt is dark brown and usually falls in the 350–400 °L range. The name chocolate is very apt as the malt gives a very chocolate-like flavor and aroma to porters. For more on this malt, see page 30. Black malt, or black patent malt, gives a very sharp, roasty edge to a beer, often with some bitter and acidic notes. The “aggressive” roast character in most robust porters is due to this malt. Black malt is usually used in conjunction with other, more mildly-roasted malts. As the name implies, black malt is very dark, with a Lovibond rating of 500 °L or more. Unlike most other dark grains, black malt has little aroma by itself. Unlike chocolate malt and black malt, roasted barley is made from unmalted barley. It comes in two different versions, one that usually falls around 300 °L and a more darkly roasted version falling around 500 °L. The darker version is the type of roasted barley found in most Irish stouts. In porters, this can be added to give some stout-like notes reminiscent of coffee. These days, most homebrewers have access to a wide variety of dark malts. These include pale chocolate malts, coffee malts, de-bittered black malts, chocolate wheat malts and on and on. Any of these are candidates to be used in a porter. Give the grains a whiff the next time you are at your local homebrew shop and you should be able to tell if you want to experiment with them. Porters are darker than brown ales or dark milds and have enough dark grains in the grist to give a roast character beyond that found in either of these two beers. On the top end of the scale, porters can be darker and more roasty than a stout, although the character of the roast is usually different — i.e. not based so much on roasted barley (500 °L). As a rough guideline, brown ales usually contain up to 0.5 lbs. (0.23 kg) of dark-roasted grains per 5.0 gallons (19 L), with the darkest grains being absent or used in very small quantities. Brown porters usually contain between 0.5 lbs. (0.23 kg) and 0.75 lbs. (0.34 kg) of dark grains, with chocolate malt being the most prevalent. Robust porters most often contain from 0.75 lbs. (0.34 kg) to 1.25 lbs. (0.56 kg) of dark grains per 5.0 gallons (19 L), with a substantial portion of the dark grain fraction being black patent. As we will see, many factors will influence how the dark grain portion of the grist is perceived. What tastes great with chocolate? How about caramel? Crystal, or caramel, malts show up in the vast majority of porter recipes. “Medium” crystal malts (40–60 °L) give a nice, caramel-like flavor and aroma to a beer. Darker crystal malts (60–90 °L) additionally give some plum or raisin notes while the darkest (90–150 °L) additionally have some roast character to them. Crystal malts also add sweetness and body to a porter. You can use one or more crystal malts in your grain bill and also pair them with specialty malts. The amount of crystal malt in porter recipes varies, but from 0.5 lb. (0.23 kg) to 1.25 lbs (0.56 kg) is typical. In lower amounts, the dark grains are at the forefront of the beer, with the crystal malt only playing a supporting role. In higher amounts, both the roast and the sweet/caramel flavors mingle. Other malts — including biscuit, Victory, aromatic, melanoidin, honey, rye, etc. — can be added to give the beer more complexity. However, as always, there’s a tradeoff; adding little elements for complexity takes focus away from the main elements of the beer. 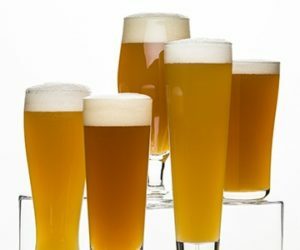 I generally prefer simpler recipes that stress the main aspects of a beer, believing that good brewing technique does far more to make a beer stand out than a hint of this or a smidgen or that. However, my porter recipes tend to be relatively complex and I do think it pays to think of all the great flavors in porters and how they can be complemented or contrasted with other beer and “non-beer” flavors. You might think that in a flavorful beer like porter, the base malt wouldn’t matter much, but it does. The roast and caramel flavors in porter don’t cover up the flavors of the base malt, they just appear alongside it. Porter is often brewed as an English-style ale. As such, a good English pale ale malt is a great base. Pale ale malts, usually kilned to around 3 °L, have an “English” nutty/toasty aspect to them that works great in big, full-bodied porters with lots of caramel character. In porters in which the roast characters are front and center, and the amount of crystal malt is limited, the more “blank” quality of domestic pale malt — often coming in just under 2 °L — may be more appropriate. The maltiness of porter can be accentuated by adding some Vienna or Munich malt to the grist. It wouldn’t be traditional, but you could also use either of these for 100% of your base malt. Extract brewers should choose a light malt extract for most of their fermentables, and steep or partial mash the roasted grains and specialty malts for color and flavors. Dark malt extracts are available; however, if you want to be able to tweak the roast character in your porter, using light malt extract supplemented by a steep or partial mash is the way to go. Beers containing more dark grains are more likely to have some astringency in them. This is because darkly-roasted malts give up their tannins a bit easier in the mash. In a dark beer like a porter, adding less dark malt really isn’t an option. So, it pays to keep two things in mind. First, if you don’t oversparge, you probably won’t get an excessive amount of astringency, even in the darkest porter. Monitor your final runnings and don’t let them drop below SG 1.010 (or rise above a pH of 5.8, if you have a pH meter). Also, you can cool down and taste little samples of your runnings as you direct them to your kettle. Once the runnings start to have a puckering, drying sensation to them, stop collecting wort. Finally, keep in mind that a hint of astringency in a porter, especially an aggressive robust porter, is not a bad thing. In most beers — especially lightly colored and flavored beers — brewers strive to minimize astringency. However, a small amount in a dark beer can actually be a good thing — a pleasant, drying sensation in the aftertaste. As with many things, it’s all a matter of degree. For all-grain brewers, a single infusion mash is all that is required for a porter. For a “rounder,” full-bodied brew, mash between 152 °F (67 °C) and 156 °F (69 °C). Mash out to 168 °F (76 °C) when the mash is done to (mostly) stop enzymatic activity. In addition, there’s absolutely no reason to extend your mash beyond the point in which an iodine test shows that all the starches are converted. For a beer that’s a bit more dry, mash around 148–150 °F (64–66 °C), for about 60 minutes. In a drier beer, the roast character will be accentuated and your porter will have a dry-stout-like element to it. A mash thickness of 1.25–1.5 qts./lb. (2.6–3.1 L/kg) will work well no matter what your mash temperature is. In any case, as mentioned above, don’t oversparge. Quit collecting wort at the appropriate time and — if needed, in a lower-gravity beer — add enough water to reach your full, pre-boil volume. Extract brewers can either steep their grains or do a partial mash that includes some base malt. When steeping the malts, hold the temperature between 150–156 °F (66–69 °C) and keep the liquor-to-grain ratio below 3.0 qts./lb. (6.3 L/kg). Cocoa and coffee are both bitter. Hops are bitter. Can these elements exist side-by-side in a porter — they sure can! Since porter originally comes from England, many homebrewers choose English hops for their brews. And, all the classic English hops will work well in a porter. One of my favorite hops for a porter is Northern Brewer. Northern Brewer is often described as a minty and, gee, do chocolate and mint taste good together? (Hint: yes.) As with the type of base malt, don’t think that the variety of hops you choose isn’t going to matter. The amount of hops you add is dependent on your own tastes. Generally, in porters with more of a focus on chocolate, caramel, sweetness or other “soft” flavors, less emphasis is placed on hop bitterness. (The BJCP lists 18–35 IBUs as the range for brown porters.) In porters with a sharper roast character, more hops provide a nice balance. (The BJCP lists 25–50+ IBUs as the range for robust porters.) In a robust porter, the hops should also have enough character to compete with the other bitter flavors. This, in my opinion, is a place for high-cohumulone hops to shine. Porter is one the best styles to add “other” flavors to. You can, for example, accentuate the chocolate-like and coffee-like flavors and aromas with actual chocolate or actual coffee. You can pair the chocolatey notes in a porter with other flavors frequently found paired with chocolate in cooking; these include raspberry, vanilla, almost anything sweet — and even a little heat from mild chili peppers. Smoked porters can also be excellent. Porter is a style of beer in which it pays to think like a cook when you formulate the recipe. Good brewing water is (nearly) flavorless; however, you need to pay attention to your water when brewing a porter to get the best character from the dark grains. In any mash, calcium ions in your brewing liquor react with phosphates from the malt to produce acid. When brewing a dark beer, the dark grains add additional acidity. When brewing a dark beer using water containing a low level of carbonates, the pH of the wort and beer can drop fairly low and the resulting beer can taste thin and acidic. At higher levels of carbonates, the pH will end up in the proper range and the dark grain character will have a full, rich chocolate/coffee/roast character to it. If you have a copy of your water report and brewing software, you can calculate a water profile that will work well for your porter. Most brewing software packages will calculate the residual alkalinity — the amount of alkalinity “left over” after you take the effect of calcium into consideration — for your brewing water based on the levels of various mineral and ions in your water. Water with higher residual alkalinity levels, anywhere in the 3.5 to 5.5 range, are best for a porter. Another option for the all-grain brewer is to mash in his porter with his “regular” brewing liquor, then stir in sodium bicarbonate, if needed, until the pH of the mash climbs to 5.2 to 5.4. Your water chemistry does not need to be extremely fine-tuned to brew a great porter. As such, you can take an approach based more on “guesstimation,” and still get great results — especially if you brew the porter more than once. For the all-grain brewer who has not previously adjusted his water chemistry, here’s a quick-and-dirty approach to sodium carbonate additions for a porter. If the best beers you have ever brewed with your untreated water were light-colored beers, add 1.5–2.5 tsp. of baking soda per 5 gallons (19 L) of mash liquor. If your best beers have been light amber, add 1.0–1.5 tsp. per 5 gallons (19 L). If dark amber beers have been your forte, add 0.5–1.0 tsp. per 5 gallons (19 L). Finally, if brown to black-colored beer have consistently outshined your lighter-colored efforts, add 0.0–0.5 tsp. of baking soda per 5 gallons (19 L) of brewing liquor. Extract and partial mash brewers have a strange dilemma when brewing a porter. All of the dark grains for your porter are steeped or mashed with comparatively little base malt. Unless you use exceedingly carbonate-rich water, the pH of your steep or mash will be very low — below a pH of 5, and maybe even below 4. Since all the dark grains are “concentrated” in a steep or partial mash, you need a lot of carbonates in the mix to counteract the acidity. As such, extract or partial mash brewers should only add half the planned amount of chalk or baking soda to their brewing liquor. The remaining half should be stirred directly into their steep or mash. Once you’ve mixed up your brewing liquor, give it a taste. You should never let your water treatment plan make your water taste bad. No matter if you’ve calculated your residual alkalinity down to 3 decimal points or just winged your carbonate additions based on the above recommendations, taste you porter critically and make any further adjustments only if the flavor of your beer requires it. If your porter tastes acidic, add more carbonate the next time you brew it. On the other hand, if it tastes flabby or the hop character seems overly coarse, add less carbonates to subsequent batches. Porters can be brewed with ale or lager yeast, but the overwhelming majority of homebrew recipes call for ale yeast. Any decent English or American-style ale yeast will work well in a porter. For a full-bodied beer, pick a yeast strain that isn’t too attenuative. My favorite porter strain is Wyeast 1968 (London ESB)/White Labs WLP002 (English Ale) strain. This is reputedly Fuller’s yeast, and they make a great porter. For a drier beer, any attenuative strain — I like Wyeast 1056 (American Ale), White Labs WLP001 (California Ale), Safale US-05 or Nottingham — will ferment to a lower final gravity. The lowered sweetness and body of the beer will accentuate roast and hop profile. In a porter, you have lots of elements to balance. Your ingredients, water, brewing procedures and how you handle the fermentation will all effect how your beers turn out. Fortunately, with porters, there is a fat “sweet spot.” Any decent recipe, brewed with acceptable water, is going to turn out fine in the hands of a competent homebrewer. After brewing your first porter, you can hopefully use the practical advice in this article to tweak the appropriate variables and create your own perfect pint of porter. Chris Colby brews porter from the carbonate-rich, “extra chunky” water of Bastrop, Texas. Mash at 154 °F (68 °C) for 50 minutes in 15 quarts (14 L) of brewing water (liquor). Mash out to 168 °F (76 °C). Boil wort for 90 minutes, adding hops at times indicated in the ingredient list. Ferment at 68 °F (20 °C). Add one 12-oz. (355-mL) bottle of Granny’s unsulphured molasses and 2.0 in. (5.1 cm) of brewers licorice for last 15 minutes of boil. Mash at 149 °F (65 °C) for 60 minutes in 10 qts. (9.5 L) of brewing liquor. Collect around 5 gallons (19 L) of wort — stop collecting wort if specific gravity of runnings drops below 1.010 — and add water to make 6.0 gallons (23 L). Boil for 60 minutes, adding hops at times indicated in the ingredient list. Add cane sugar for final 15 minutes of boil. Ferment at 68 °F (20 °C). Omit pale malt. Add 3.0 lbs. (1.4 kg) of Coopers Light liquid malt extract to the ingredient list. Use a 2.0-gallon (7.6-L) beverage cooler as a mash tun for your partial mash. Mash at 149 °F (65 °C) for 60 minutes in 5.5 quarts (5.2 L) of brewing liquor. Collect first wort and add 180 °F (82 °C) water to cooler to restore previous liquid level. Collect second wort, add water to wort in kettle to make make 3.0 gallons (11 L). Bring wort to a boil. (No DME is added before the boil.) Boil wort for 60 minutes, adding hops at times indicated in the ingredient list. Add liquid malt extract and sugar with 15 minutes left in boil. Cool wort (perhaps by placing brew pot in cold water in sink), then transfer to fermenter. Top up with cool water to 5.0 gallons (19 L), aerate and pitch yeast. Ferment at 68 °F (20 °C).